We all know artificial intelligence (AI) is a hot topic — but beyond the buzzword, have you ever wondered how IT departments are actually adopting AI technologies to improve on their operations? "Technology that appears to emulate human performance typically by learning, coming to its own conclusions, appearing to understand complex content, engaging in natural dialogs with people, enhancing human cognitive performance (also known as cognitive computing) or replacing people on execution of nonroutine tasks. Applications include autonomous vehicles, automatic speech recognition and generation and detecting novel concepts and abstractions (useful for detecting potential new risks and aiding humans quickly understand very large bodies of ever-changing information)." According to a recent study conducted by Tata Consultancy Services(TCS), 46% of the companies surveyed said their IT departments are using AI. But for what? Mostly for security intrusions, resolving user issues, automating production management and gauging internal compliance. 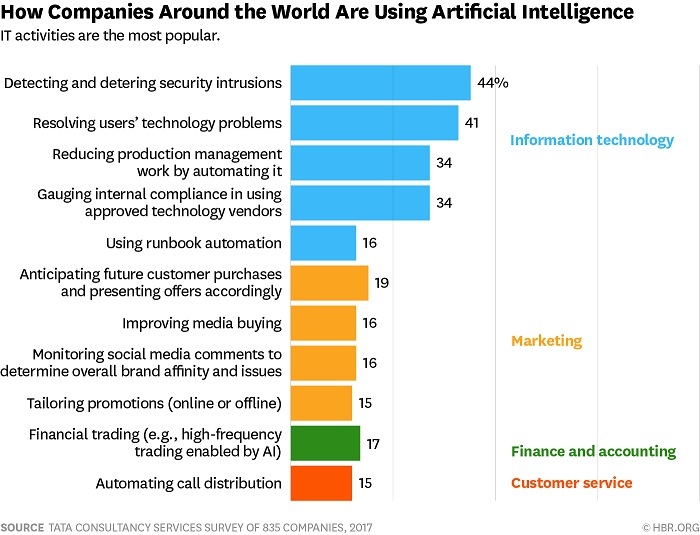 According to the TCS study, the highest percentage of organizations using AI is in the energy industry, with 100% of them using AI to some capacity, followed by high-tech and telecommunications. Ultimately, whether using AI for security intrusions, IT problems or otherwise, the main driver for IT in using this technology is to improve product and service quality. That is why it is no surprise that IT vendors have been developing AI solutions for IT professionals in the end-user computing space, be it for application, hardware, services management, etc. Particularly, as it pertains to tools that monitor the digital experience, AI technologies help support this goal while also helping clear up IT's time for higher value activities. How AI Will Transform IT Operations in 2019? Gartner recently published its Top 10 Strategic Technology Trends for 2019 which outlines the empowered edge as a top trend noting: "Through 2028, we expect a steady increase in the embedding of sensor, storage, compute and advanced AI capabilities in edge devices." With the introduction of AI into IT operations, IT teams continue to find new use cases for AI and its applicability to edge computing is no exception. Perhaps one of the most promising use cases in this space, in part because of its clear and strong business value proposition, is Level 0 support, an automated or self-service style where users can access help themselves without the aid of the help desk. AI technologies, used in tandem with end-user computing or digital experience monitoring tools, are now being used to deflect user-facing issues from even reaching support desks using self-healing and self-service — Level 0 support. AI's role in Level 0 is identifying patterns in the monitored environment that can then help inform IT or automation technologies to solve a problem. The value proposition of such solutions is simple, it is a way to reduce support desk costs and free up agents' time to focus on higher value interactions, which are more complex issues and require humans. Some components of Level 0 support are not new. Unfortunately, this level of support has not been executed successfully by many IT departments. With AI advancements, the future seems very promising for the effectiveness of self-service programs and the adoption of new automation processes that ultimately help improve quality for users.